Took the train at 6 plus in the morning. Arrived in the Capital of Germany at 12pm. When I went to the hostel to check in, I was told that I had to wait a for a few hours later for my room to be ready. Then I asked her to check if there are any rooms available because I wanted a place to settle down a bit first. She said no. Then went I was about to leave the counter, she said that I was lucky because there was a room booking that was canceled last minute and I could have the room! I was a happy boy! She was kinda rude though. Took the U-Bahn to the Berlin Wall, more specifically, the East Side Gallery. The Berlin Wall was a barrier constructed by East Germany starting in August 1961, that completely cut off West Berlin from East Germany and East Berlin. Little is left of the Wall at its original state, which was destroyed almost everywhere. The remaining stretch of the Berlin is actually quite long. I didn't walk the whole stretch. After walking for a while, I went to Checkpoint Charlie. Do you see Charlie there in the big poster above? Ok, that is nonsense. The reason why this checkpoint is called Charlie is because of the phonetic alphabet; checkpoints "Alpha" & "Bravo" were located elsewhere. So this is Checkpoint C, which is Checkpoint Charlie. Get it? Checkpoint Charlie was a crossing point between East and West Berlin during the Cold War. Formerly, it was the only border crossing between East and West Berlin that permitted foreigners passage. Residents of East and West Berlin were not allowed to use it. This contributed to Checkpoint Charlie's mythological status as a meeting place for spies and other shady individuals. Went to a famous landmark in Berlin - The Bradenburg Gate. 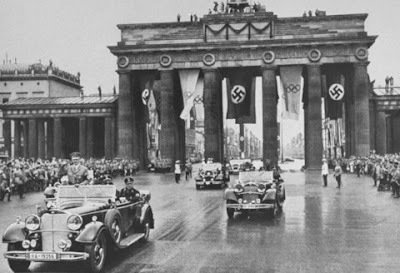 The Gate was commissioned as a sign of peace but when the Nazis ascended to power, they used the Gate as a party symbol. The specialty sausage in Berlin is the Currywurst. It is a sausage covered in ketchup and curry powder. I knew I had to try it! And you know what? It was soooo good that I decided that the Currywurst was going to be my favorite German Sausage! And it still is. Took a long walk around the city. And there was a Berlin Marathon going on! Then walked around a open Market - Hackescher Markt. This is a popular place for eating out with nice bars and restaurants. Walked a bit more and took the S-bahn back to my hostel. Next morning I was heading to Copenhagen, Denmark! After visiting the Berlin Wall, MY LIFE WAS NEVER, EEEEEEEEEEEEEEEEEEEEEEEEEEE........................EEEE............................EEVER, THE SAME, AGAIN!! !